With Club Penguin: Game Day!, players can experience the fun and creativity of the snow-covered online world of Club Penguin on Wii for the first time. 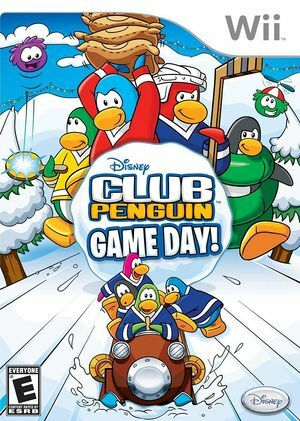 Based on the popular virtual world that's captivated millions around the globe, Club Penguin: Game Day! is a collection of fun new mini-games that will challenge and engage the whole family. Players can create a penguin, join a team and participate in a series of events, including Sumo Smash, Java Sack, Fast Freeze, Sled & Slide, and more. Each time players beat a challenge, they conquer a zone on the island. The ultimate goal? To work together with their team and conquer as much territory as possible. When you access your profile in-game, the penguin doesn't show up. Possibly it has the same issue as Super Smash Bros. Brawl's Classic Mode. The graph below charts the compatibility with Club Penguin: Game Day! since Dolphin's 2.0 release, listing revisions only where a compatibility change occurred.